Why is poker so interesting and exciting? Perhaps because it’s reckoned to be the game with the most perfect mix of luck and skill – and that probably accounts for why it’s a life-long passion for so many, people. Some players start out thinking that if they learn the rules, that’s enough. Well maybe, if you’re playing Patience. But with Texas Holdem, poker, rules are just the beginning. After that comes strategy, probability, calculation, cash management, observation and just plain guile. The Texas Holdem rules matter though- so let’s look first at how to play the most popular online poker game on the planet. You are trying to make a poker hand of five cards. See here for more details on winning poker hands. The dealer deals everyone at the table two cards each – these are face down to the other players. Everyone looks at their cards, decide how much potential they have to make a winning hand – and bets. Three more cards are dealt out face up, for everyone to share. This is what you may have heard mentioned as “the flop”. You’ll be getting two more cards later, and can “mix and match” to put together the best hand. Everyone looks at how the three cards have changed the possible hand they could make with the two they have already. Then they can “check” – not bet, or “fold” – turn in their hand – or bet again. A fourth communal card is dealt – this is called “the turn”. Again, players reassess the potential of their hand and bet on it. A last card, that is called “the river” is dealt face up. The players can now build a five card hand from any of the five cards that are face up and the two cards that they have face down. When all the cards have been dealt, you can see five of them – but each player has two hidden. This can mean that they have a great hand that looks like nothing on the table. On the other hand, so can you. It can be a great bonus if you can keep a low profile, betting discreetly until you’re ready to ramp things up a bit. People look carefully at the cards that are on the table, and count them up to help calculate what other players are probably holding. For example, if there are two jacks on the table and you’ve got another one, you know nobody can make up four of a kind in jacks. The calculations get much more complicated than that though, and anyone who loves doing logic puzzles under time pressure will get a tremendous buzz out of trying to figure out who has what, and what the odds are of your hand winning. For those who are seriously interested in this side of the game, the next step is to find out something about probability. 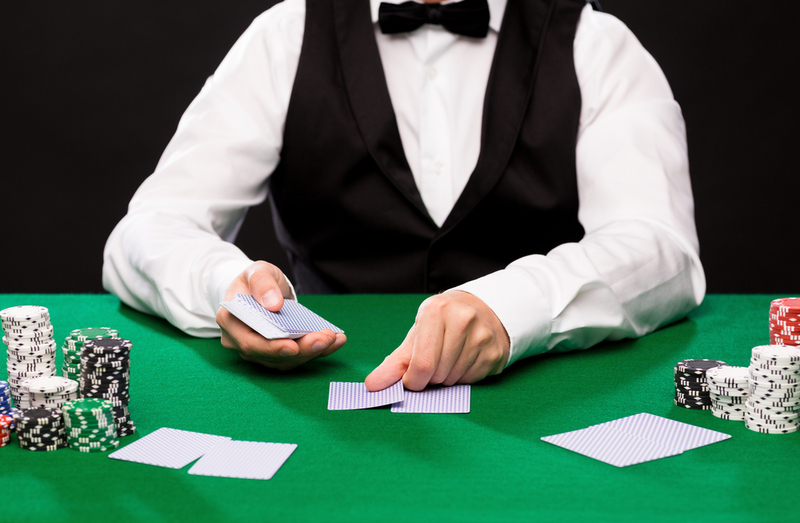 Probability is the magic ingredient in figuring out how likely you are to be able to build a winning hand. Say you have a nine, ten and a jack. What are the odds at that point, that you’ll be able to build a run (straight) by adding a queen and a nine? Probability will tell you and will also tell you how the odds are changing as other cards go down on the table. In our example, there are 8 possible cards that could complete the run. You can calculate the percentage likelihood of getting one of these, given the number of unknown cards in the pack. Even if you’re a maths genius, you can be completely undone in a live game by giving away your likely hand through gestures and behaviour. Surely not online though? Well actually yes. Look at how eager someone is – how quickly they bet, and how much they are betting. Are they trying to bluff? Have they bluffed previously in this game? Or are they trying to give you the impression they’re undecided? All of these can give you extra information about the player, even when you’re not in the same physical room. You’ve started out with an amount you have to play with – say it’s £25. And let’s say you’re at a table where it costs round about £5 to stay with the game right down to the last bet. If you’ve only stayed in the game out of curiosity, rather than to back a hand you’re sure can win, you’re burning cash. And when the time comes that you have a sure fire winning hand, you may find that you can’t afford to back it all the way. Shortly after that, you have to stop playing because you’re out of money. So keep your powder dry – then you can do justice to the one or two great hands you’ll get in a session. Look for easy deposits and withdrawals – you shouldn’t have to wait days for your money and the best sites will let you cash out in minutes. You’ll probably want a site that lets you deposit by credit card – and a joining or loyalty bonus always goes down well. Fast, reliable software is important for absorbing online play – no pauses, buffering or glitches. And the graphics make a big difference to how enjoyable and realistic the game is. You may also be more comfortable with a UK site, that aims its offers at British players and complies with UK industry regulation. Have fun exploring the online Texas Holdem world – enjoy the game and remember to play within your limits.